I added a new bobblehead to my growing collection today. Its of Harry Kalas, and was a stadium giveaway on 8/22/10 from the Wilmington Blue Rocks. Its already fitting in nice on the shelf next to my Kalas/Ashburn dual bobblehead and all three Kalas Upper Deck Sweet Spot autographs. Last Sunday, the Wilmington Blue Rocks gave out a new Harry Kalas bobblehead to the first 1,000 fans through the gate. Before this, Kalas’s only bobblehead came from a stadium giveaway in 2002 and also contained Richie Ashburn. Many of you know how much an HK fan I am, and I have a feeling one of these will be reaching my shelf soon. Although its not quite as popular as the one featuring HK and Whitey, they seem to sell for $25.00 to $45.00. Having almost 8,000 subscribers and 8.5 million total upload video views, makes Chris Justice one of the most popular video box breakers on YouTube. Chris owns and operates The Hobby Box which is a sports card shop located in Wilmington, North Carolina. Chris was nice enough to take some time and answer a few questions I had about his shop, YouTube, and The Hobby. Be sure to check out his channel and site, CardsInfinity.com. What made you want to open The Hobby Box? I have collected since I was a teen and I have always enjoyed sports and sports cards. In the early 90’s I went to college and graduated with a BS in Information Systems. I enjoyed computers, but I could not see myself working on one all day long, day in and day out (funny I do that now in this hobby :)). So during and after college I worked as a bartender for 8 years. I really enjoyed talking with customers and watching sports while working :). 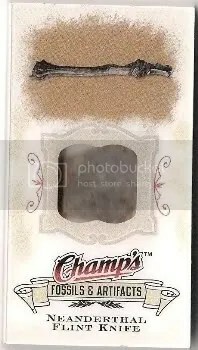 Around 2004 a friend of mine showed me what the card companies were doing with sports cards and I thought it was the coolest thing. They were embedding jerseys in cards as well as having them autographed. Well my interest was struck, so I got back into collecting pretty heavily. There was only one shop in my town and the guy charged really ridiculous prices for his hobby boxes. So since I enjoyed sports and sports cards I decided to open my own store and that is how The Hobby Box got started. How important is YouTube to your business? Do you think it’s possible for a hobby shop to survive without having a presence on the internet? Let me explain how I got started on YouTube. I started my store in April 2006. Customers would come in and break boxes and it was really exciting to see what each box produced and their reaction to the cards they pulled. At that time the only place to really share your break was on a card forum. You would sit in front of your computer and type out what you got and post a scan. That is really fun in itself, but you don’t get the persons reaction to the break. I was selling a shirt that I had made out of 550+ jersey cards on eBay. The winner of that shirt was Dr. WaxBattle. He has a website called The BackStop.net. I checked out his website and noticed that he was taping customers breaking boxes. I thought that was the coolest thing ever. Not only do you get the first look, but you get to see the reaction of the person opening the box. Then I searched YouTube to see if others were doing it and there were only about four. Joe Holman was breaking a blaster box here and there, Backstop was doing it, Rip & Pull, and a guy by the name of KoolJazz1966. I really loved all their breaks, but KoolJazz stood out the most and here is why. This guy just seemed so into sports cards and I loved his reaction. Just a down to earth guy that was not in it for the “BIG MONEY” pull, but the actual love of opening boxes. “Box Break Thursday” he called his breaks, and he would tape the breaks for the guys on TCC website (Trading Card Central). As much as I loved his reactions and admired The BackStop, Rip & Pull and Joe for starting the whole thing, there was something missing. The missing part was they were not allowing the viewer to live vicariously through the break. Plus they were showing way too many base which can make a break rather long and boring. I thought I would start taping my customers opening boxes in the vicarious position and we would also breeze through the base cards. This way people can see what the major hits are, get the reactions, and at the same time live vicariously through the break. So that is what I did and that is basically how I got on YouTube. Now I didn’t get on YouTube to make money. That was not even on my mind. I did all the videos specifically for the love of the hobby and to have fun with it. I started selling boxes on the internet about 7 months later when people kept asking me if I would sell them a box. I was like sure, and if you like I can break it here for you and upload the video and mail the cards. A lot of people liked the idea and that is how it all got started. So in a nutshell, YouTube is very important to me. It brings together a community of people that, when on the internet, feel like they are all at the card shop together. It is a place where people can share cards they have pulled with others and at the same time create good friendships. Yes, I think Hobby Stores can survive without the internet. There are a lot of shops doing that very thing right now. It is harder without the internet but it can be done. I do a good portion of my sales through the internet now and I do appreciate all the business people give me. What are some things you would like to see the manufacturers do differently to make The Hobby more enjoyable? They need to send me a case of the new product a week before it releases so I can do a FREE group break for people :), just kidding. Although that would be fun!! Let me defend card companies for a second. People always give card companies a hard time. I don’t think they realize what a tight rope these card companies have to walk. They have to produce a product with big names that everyone wants without flooding the market with big names. For example, everyone wants a Michael Jordan autographed card. Upper Deck could put one in every other box and guess what? Pulling a Michael Jordan card has lost all of its luster and excitement. Not to mention its monetary value. But with that said, I think ALL card companies should always honor redemption cards PERIOD. There is no reason what so ever that they should not do this. The card should have been in the set before the product was released. It is not the consumer’s fault that it wasn’t. Sure the card companies would need a pretty big filing system, but if the card was made it should be filed away in the “Redemption Room” and should always be there until that card is redeemed. If the card was never made, then they should give you equal value of the card at the time of it being pulled. If they did it this way you can bet there would be a lot less redemptions, because card companies would get sick of storing all the cards when they are made. It is very frustrating for a person to open a box and pull a Cal Ripken/Derek Jeter Dual autograph #d to 5 and it be expired. That one change would make the hobby a lot more fun and enjoyable. Of all the products you have opened, which have been your favorite and least favorite? Why? Favorite is Exquisite and the reason is simple… it is so DAMN expensive that it makes you nervous to open it. Anything that can get your heart going is exciting and Exquisite does that. Which future product release are you looking forward to the most? Not sure if they are doing it, but if they are, I am really looking forward to National Treasures Basketball. I think it will be a very exciting product loaded with really nice looking cards. What is the most valuable card pulled from your shop? That depends on your definition of value. The weirdest card I have seen pulled was a Neanderthal flint knife. It was a redemption, but Jerry, the guy who pulled it, sent me a scan when he got it back. Very unique card. The coolest looking card was pulled just the other week and that was a Felix Hernandez WBC full size logo patch. As far as actual sell value goes, I pulled a Tiger Woods 2001 Sp Authentic GOLD version red shirt swatch #d/25. I sold the card for $1,200 BIN, but I saw another one surface again during Tiger’s big run in 2007 or 2008 and it was bid up to $3,600 but didn’t meet reserve. I’m not sure what it would sell for now, but that is the most expensive card I have ever pulled. I have had several $1,000+ cards pulled from my store though. Always fun to pull a big valued card, but I am just as happy when someone pulls the person they collect and are looking for. According to Upper Deck, there are only 9 of these Neanderthal Flint Knife relics. What do you have in your personal collection, and what are some of your best pieces? I really collect rookie autographs. I have a lot of those. My biggest cards are probably my Solomon Jones collection :). I have a few of his Exquisite 1/1’s, Superfractors from Finest and Chrome rookie autographs. I have quite a few MJD cards as well. Terrence Williams is my new player to collect.